JUN Machine Shop has added a custom kit for Mitsubishi Lancer Evolution X (CZ4A/4B11) engine. This Custom Kit for 4B11 expands engine displacement by enlarged bore and stroker. The engine displacement is 2307cc. 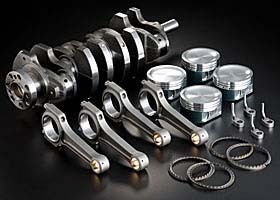 The JUN Custom Kit provides more power and torque capabilities of your Stroker Assemblies - Includes JUN Crankshaft, JUN Piston Kit and JUN Super Connecting rods. The lightweight, high strength, and rate of balance of those parts are improving. The high response is offered. You can use broadly in various fields as circuit running, drag race etc.